This figure was prepared byis available from . A typical modern temperature construction involves tens or hundreds of records to ensure reasonable global coverage. Because the average shown here involves only 8 records, it is entirely plausible that significant contributions to temperature variation are being overlooked because certain large regions (e.g. Asia) are not being sampled. Different regions have different sensitivity to global temperature variations, so one can reasonably argue that a true global average reconstruction requires scaling the different records to match local sensitivity. Since no scientific consensus exists for how to do this, no attempt was made to do this. 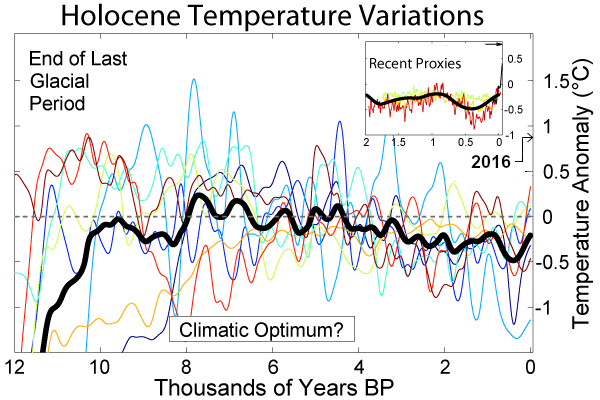 Given the limited spatial sampling, it is unclear whether the slightly warmer period during the Holocene climatic optimum corresponds to a statistically significant difference. Because the Davis et al. pollen reconstruction is based on measurements across many sites in Europe, it is more reasonably described as a regional rather than a local temperature measurement. Similarly, it shows considerably less short-term variability than most other sites. A small number of records, not used in this study, have been interpreted as indicating much larger temperature variation during the Holocene (5+ °C) than the records represented here. In many cases, critics have interpreted these changes to reflect seasonal, rather than annual variations in temperature, or very unusual local changes. However, the possibility exists that the current reconstruction underestimates long-term variability. During the earliest parts of this record, the timing uncertainty on some records may become substantial, potentially exceeding a couple hundred years. This could have the result of causing correlated features to fall out of alignment. And the most important caveat: Though all of this data is published, and the methodology is similar to previously published methodology, and resulting average is similar to previously published interpretations of the Holocene, even so, no peer reviewed scientific publication has ever combined precisely these data in precisely this way. Hence, any interpretation of that average must be regarded with skepticism. The time scale for the EPICA ice core was adjusted to the EDC1 (Schwander et al. 2001), which is the preferred time scale for the last 80 kyr. The time scale for sediment core ODP 658 was converted from the listed Carbon-14 time scale to calendar years by using the marine INTCAL04 calibration curve (Hughen et al. 2004). Because of poorer data resolution, the sediment core PL07-39PC was smoothed to an approximately 500 year average. δDeuterium record of the EPICA ice core was converted to temperature variation by using the δDeuterium to temperature proportionality determined for the Vostok ice core. δ18O temperature proxy from the Kilimanjaro ice core was converted to °C by scaling its variance from the interval 100-6000 years BP to match that reported in the Vostok ice core during the same period. This page was last modified on 7 August 2011, at 02:52. To modify annotations, your browser needs to have the XMLHttpRequest object. Your browser does not have this object or does not allow it to be used (in Internet Explorer, it may be in a switched off ActiveX component), and thus you cannot modify annotations. We’re sorry for the inconvenience. http://www.surfacestations.org/ One of temp source variables. Note that this month I have taken the liberty of adding a 3rd order polynomial fit to the data (courtesy of Excel). This is for entertainment purposes only, and should not be construed as having any predictive value whatsoever. May 11 TA 0.23 SS 40 (prior – est from graphs). July 11: TA 0.37 degC; CO2 391.4; SS 119 (then 54); SF 98 (then92) per WUWT (rev 10/8). [Revised again 11/8: CO2 – 391.8, SS -12, SF – 87.] On 23/8 SS became 66, SF became 104. Still trying to understand this as I thought the figures were monthly totals! Here we go again: 25/8 SS=75, SF = 104, still labelled July. 13/9 Widget update – Aug TA 0.33, then as above. 06/10 Sept GTA 0.29, CO2 391.7, SS 126, SF 129 Interesting cooling trend! 05/11 Oct GTA 0.11, Sept CO2 392.3, (?oct ) SS 161, SF 169.
c.23/11 Oct GTA 0.11, Oct CO2 392.22, [less if you believe the accuracy is possible, maybe following the decreasing GTA :-)] SS 101, SF 141.